Prepare and bake a 9 x 13 cake according to the directions on the box. With a wooden spoon handle, or some similary-sized object, begin poking holes in the cake. In small bowl reserve ½ cup of the sweetened condensed milk and set aside. Pour the remaining sweetened condensed milk over the entire cake. Let it soak in for about an hour in the fridge. Add in the powdered sugar and cinnamon and mix until combined. Add reserved sweetened condensed milk and mix until combined. 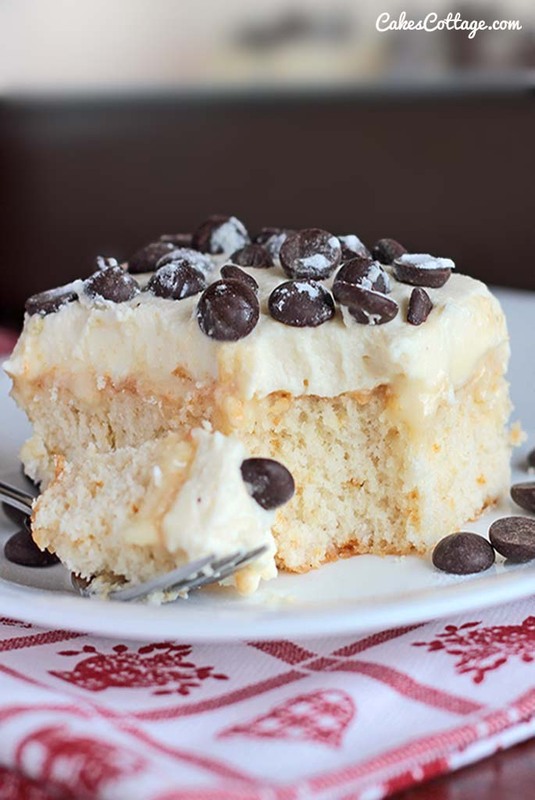 After the cake has absorbed all the milk, spread the cannoli topping evenly over the top. Garnish with mini chocolate couverture(or mini chocolate chips) and sprinkle with powdered sugar. Cover cake and allow to set in refrigerator for 2-3 hours. To me, it's even better the next day, so it's a great dessert to make ahead.